To examine relativistic time dilation we consider the separate journeys that both twins make to Cloud City. Leia travels from the neighbouring system of Anoat, while Luke travels from the much more distant planet Dagobah. Luke’s journey was ~7 days travel in his own reference frame, which was estimated to be 25 times longer than Leia’s, making her journey 0.28 days (6.72 hours) in her own reference frame. Additionally, as Leia travels in the Millennium Falcon, a much larger ship with more powerful engines than Luke’s X-Wing Starfighter, it was assumed that it reaches a higher velocity of 0.99999c compared to the 0.99995c achieved by the X-Wing. Leia’s journey yields a time dilation of 62.6 days, which at a much faster speed means she is younger than Luke for the duration. 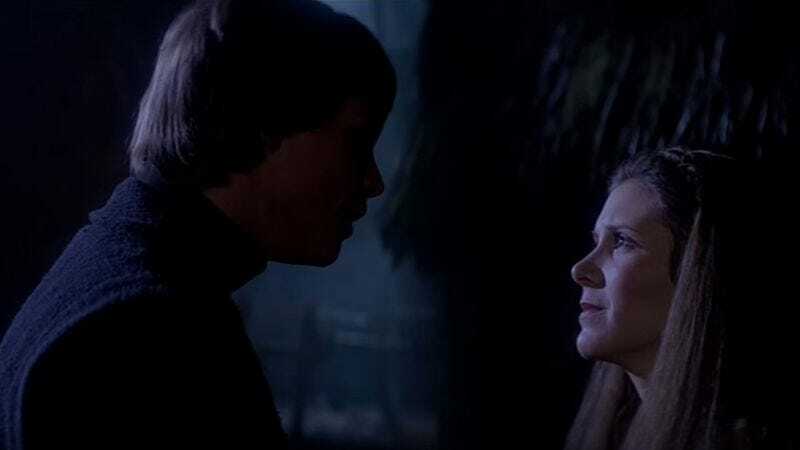 However Luke’s journey is much longer so over this period of time he ages slower than Leia, as she is stationary once she arrives at Cloud City. The time dilation Luke experiences whilst travelling is 700.8 days (1.92 years). Luke is therefore 638.2 days younger than Leia. There are a lot of assumptions here about a Star Wars universe featuring magical bacteria and laser swords—namely that anyone involved in the creation of the franchise gave a damn about science or physics. The authors themselves note that the age discrepancy “is not demonstrated in the film,” because why would it be? On the other hand, this theory could explain why Obi Wan Kenobi looks so damned old by the time Star Wars: A New Hope rolled around.